If there is one thing my husband and I love to do, it’s go to movies. B.K. (before kid) we went every to see a movie every weekend. Sometimes two. I still remember the last B.K. movie we saw, In Good Company. I seem to remember it was a cute movie. What I do remember is having to pee, like, three times during it, as I was a gazillion months pregnant at the time. Since Jordan was born we’ve been to no more than 10 movies. In over seven years. By the time you pay for a sitter, who can afford a movie? Back in our movie-going heyday, we lived in Chandler, Arizona, home of the mega-movie theaters. I have fond memories of those theaters, probably because being able to go to a movie without worrying that your phone is off for an hour and a half and someone might drown or get sick or need you was quite nice. The other fond memory I have of those theaters was that they offered a popcorn seasoning bar. You could get your ginormous tub of popcorn and then add flavor. Like movie theater popcorn, only better. Alas, movie theaters here in Sacramento (at least the ones by me) don’t have this option. Something I never thought to do was buy my own. I mean, I stuff my purse with everything else at the movies, why not bring my own seasoning? 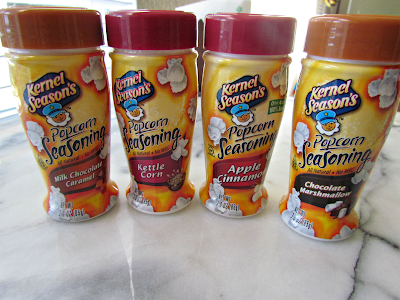 So, when the folks at Kernel Season’s contacted me about trying their popcorn seasonings, I was so on board. Like, faster than you can say “popcorn seasoning!” I asked, of course, that they send me sweet flavors (although, their savory ones sound super awesome, heeellloooo parmesan and garlic!) because, well, this is a sweet blog. And boy, did they deliver! I got four fabulous seasonings to try: Milk Chocolate Caramel, Kettle Corn, Apple Cinnamon, and Chocolate Marshmallow. Of course, I couldn’t just put them on popcorn, now could I? Instead, I made a sweet pie. 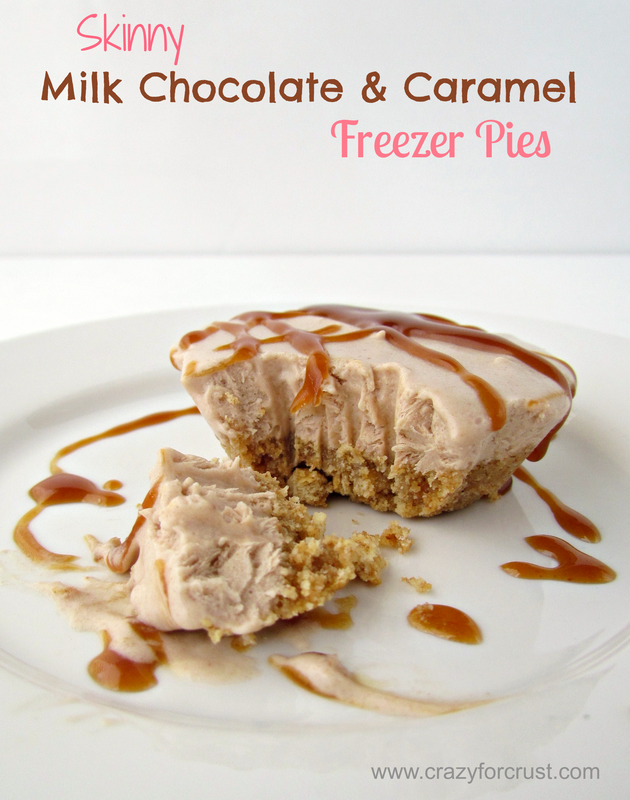 A frozen sweet pie, flavored with the Milk Chocolate Caramel flavor. Aaaandd…because I went to Old Navy last week to try on clearance clothes and somehow their sizing is all messed up and I’m not the size I used to be, I made these skinny. My husband does weight watchers online, so I input the recipe into his builder using the low/fat-free ingredients I’ve noted in the recipe, and it told me that these babies are only 2 points+. And they’re gooood. Which means I can eat two. That’s another thing that is awesome about the Kernel Season’s flavorings. They are all really low-cal and you don’t need a lot to flavor your popcorn, cereal, coffee, oatmeal, or whatever your mind can imagine. 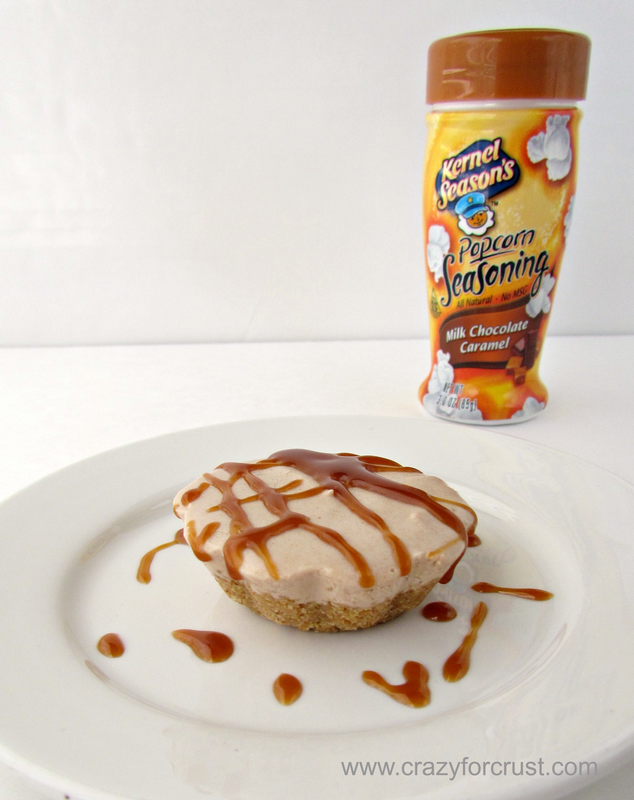 So it’s a great low-cal way to add sweet flavor without adding pant sizes. I have soooo many ideas on how to use these. Especially one with the Chocolate Marshmallow. And the Apple Cinnamon. Stay tuned! I can pretend that the caramel sauce for garnish is skinny too, right? Good, because, um, I *may* have licked my plate. Line a 12-cup muffin pan with liners. Finely grind graham crackers in a food processor. Add to melted butter spread and stir until combined. Equally divide between each muffin liner. Press to compact (I use the bottom of a shot glass for this step). Stir Cool Whip, yogurt, vanilla, and Kernel Season's powder in a medium bowl. Equally divide it among the muffin cups. Freeze until solid, at least 3 hours. Let sit at room temperature for 5 minutes before serving. 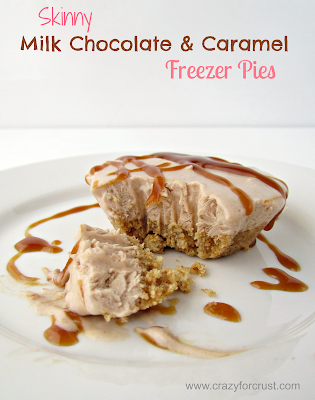 Top with caramel or chocolate sauce if desired. Kernel Season’s provided me with four bottles of their flavorings to try and review. All opinions are my own. Kernel Season’s can be found at major grocery stores as well as Target and Walmart or online. Loving your blog Dorothy! It ROCKS! Thanks Jackie! You’re a sweet friend. 🙂 Thanks for always visiting! these look simply delicious and sinful!! yum! These look so good, I am going to have to give them a try! Fun idea and super-tasty looking! Thanks! These look yummy! I am going to make them this Sunday, that way I can enjoy all the football food and not worry, right. We live out in Cave Creek, AZ but my husband works down at Intel in Chandler. I bet you’re getting to enjoy fall in Sacramento while I am praying to see it by Thanksgiving. LOL. Thanks for sharing this! I know right where that Intel is. We used to live close by! It doesn’t feel like fall yet, hopefully soon! That was one thing that reeeallly bummed me out in AZ. I missed the seasons! Enjoy! Sorry about that! WP is funny that way sometimes. Thank you so much for your comment! These look so simple and super delish! I need to be placing an order soon with kernel season’s. We’re big fans at my house and eat tons of popcorn. (The cajun mixed with white cheddar is the best!) I use the parm and garlic in a lot of my cooking too. Thanks for sharing this recipe, I can’t wait to try it! I love their stuff! And that sounds like a great combo! This sounds really good and SO easy! 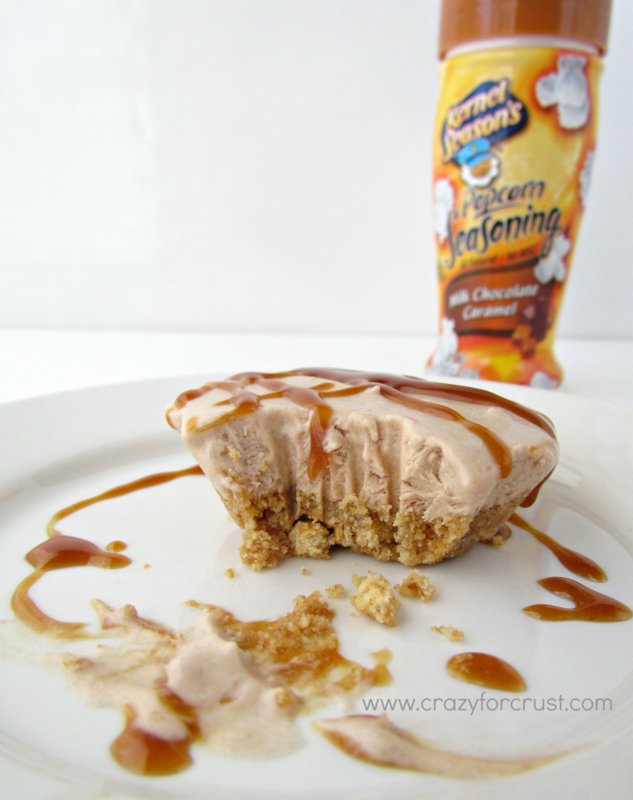 Thanks for the good idea for a summer snack! Just curious, did you use cupcake liners or anything? Or did they pop right out of the muffin tin? Yes, I used cupcake liners – makes them really easy to come out! Then just peel off the liners!